My wife recently took on the project of refinishing some wrought-iron stuff around our house. She used wire brushes, paint brushes, and — in the case of some lawn furniture we inherited from my grandparents — spray paint. Lots of spray paint. Somehow she ended up with black feet. As a result, I shirked my nightly duty as her personal foot masseur. But there was an even worse consequence. Evidently the prolonged action of spray-painting put undue pressure on her index finger, producing carpal tunnel syndrome or something like it. This wasn’t her first experience with the ailment. I don’t think it’s been clinically established, but the demands of her job might even make her prone to it. As a professional costume draper she works constantly with her hands, not only creating patterns but also fitting actors and, if the need arises, cutting and stitching fabric herself. She also draws beautifully, cooks delicious meals, and… well, I could go on and on. She is in possession of very active and highly creative hands. Or luminous hands, in the terminology of this blog. I don’t wish carpal tunnel syndrome on anyone, but it’s especially painful to see it dim such magnificence. 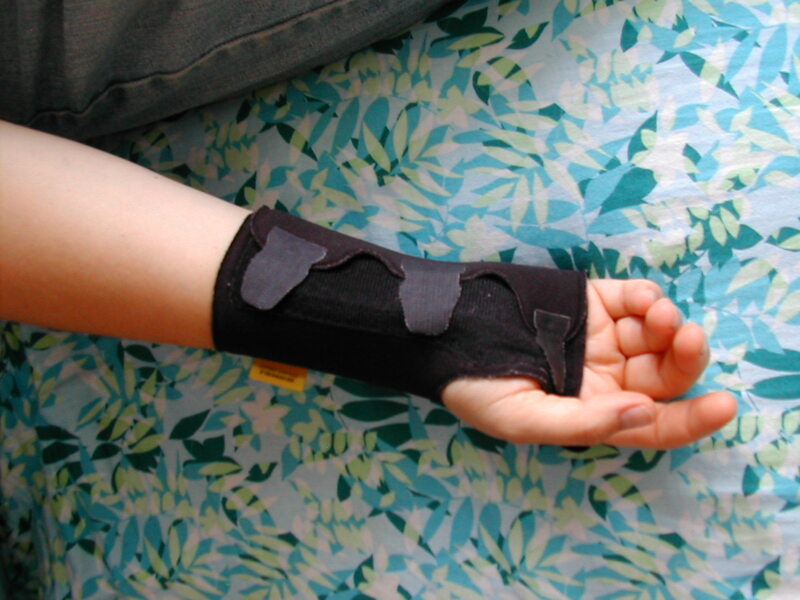 The black wrist-brace resurfaces from its bedstand drawer and cloaks a thing of beauty. A day or two of mourning-in-miniature passes. Then the veil lifts and life returns. Someone once told me that we love others for who they are and, equally importantly, for the things they do. That’s as good a formula as any. The first part is static, written in the starry firmament, while the second suggests a state of perpetual renewal. Over and over again this aspect of love ignites and turns to coal, not because we fall in and out of it, but because we willingly accompany each other through shadow and fire. Our greatest pain and our greatest joys are discovered there, in the changing light that we shed for each other. Talk About a Luminous Hand! 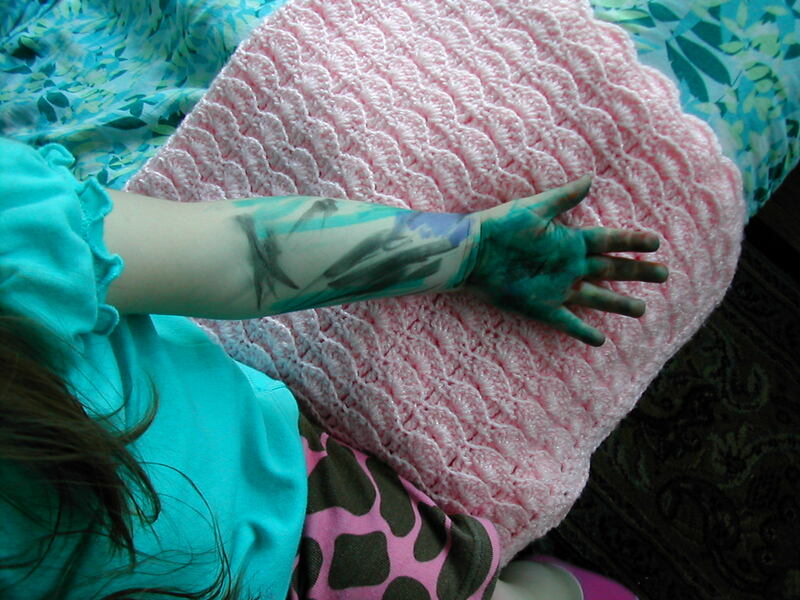 My daughter has been going through a “drawing on herself” phase. This has occurred mostly with washable markers, so my wife and I figured it was better than her scribbling on the walls or furniture, which both of our children are fond of doing. Still, the body art got to a point at which we tried to redirect her back to plain old paper. Now I kind of wish we hadn’t. I miss the Dolphin. That’s right, the Dolphin. Evidently, applying multiple colors to one’s hand and forearm is the best way to create a friendly and intelligent marine mammal. We know where she got her basic awareness of dolphins—from a library book—but I’m still trying to get a better picture of her thought process. Either she envisions her hand as the ideal canvas on which to depict a dolphin or she wishes the humble, landlocked appendage could actually be the subject of a Cousteau documentary. In other words, is the Dolphin a tattoo or a puppet? Is it a kind of talisman or an attempt to inhabit another form of life? For now it’s all a matter of interpretation. Until a clear answer emerges, I’ll content myself with being in awe of the almost-three-year-old imagination. A couple of people who have read my “About the Blog” page don’t understand what Adam Smith has to do with anything—in an arts-related blog, anyway. Granted, if you majored in 20th-century pop culture studies or if you’re currently drawing graphic novels in your parents’ basement, you probably don’t know or care who Adam Smith is. To be honest, I barely do. But certain kinds of news events—global conglomerates commiting ecological manslaughter, let’s say—remind me of some of Smith’s ideas and help illustrate my reasons for squandering pixels on him. For those who need a little background, Adam Smith was a Scottish Enlightenment philosopher who wrote something called An Inquiry into the Nature and Causes of the Wealth of Nations. In this and other works, he made brief but emphatic references to an “invisible hand” capable of steering society in the proper direction. Although its meaning is still debatable, the phrase has become a tasty cud for many a conservative mouthpiece. Now, a bit of historical context. During Smith’s era, in which Great Britain struggled to maintain her vast North American colonies, the Crown wielded an overbearing and dysfunctional control over commerce. In response, Smith argued that the cumulative self-interest of every citizen could guide a nation more effectively than the iron fist of government. Today we can recognize both the strengths and weaknesses of Smith’s theory. Free enterprise is essential, yet we have also seen that complete self-interest on the part of the individual points the way to disaster. This is equally true in politics, religion, science—and, yes, art. Without a soulful and proactive engagement in the life of our national community and our planet, the filmmaker, painter, poet, and musician offer us nothing of real value. They create what amounts to garbage and pollutants. It might even be said that they put our society in peril, just as any Big Oil fat cat does when he obeys only his own needs. Instead, the artist-citizen must employ a luminous hand—an incandescence that comes from experiencing the beauty, worth, and dignity of all people, all living things. This light is both the source and the instrument of all art. At its brightest, it connects us with genuine human needs and the ability to serve them. Does that translate into cheery paintings, stories with happy endings, gung-ho activism? Hardly. Artistic truth has a tendency to terrify, sadden, or anger us. But no matter how dark the setting or the canvas, the luminous hand acts as a powerful antidote to the toxins of ignorance and greed, and we should wield it wherever they well up.